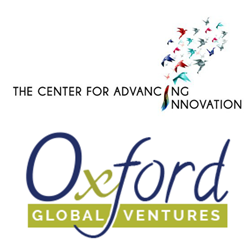 The Center for Advancing Innovation and Oxford Global Ventures announce the formation of a unique commercialization partnership to advance federally funded inventions. CAI helps institutions maximize the commercialization potential of their most promising inventions. A main component of this effort is performing an evaluation of product-market fit with world-class venture teams and bringing the most commercially relevant IP to the attention of the entrepreneurial community and potential investors. With a novel, award-winning challenge catalyst and accelerator, or “entrepreneurial boot camp”, CAI is able to fast-track IP to markets, surrounding new startups with elite, seasoned industry mentors and advisors. OGV offers Entrepreneurship Programs at Oxford, England in order to help entrepreneurs develop business ideas and launch startups in one of the world’s top entrepreneurship and innovation ecosystems. The programs include world-leading speakers, visits to Oxfordshire’s innovation system, and the opportunity to network with startup leaders and investors. OGV entrepreneurs achieve true global scale by linking them with funding and coaching services in the UK and Europe. CAI brings the US investors and mentoring platforms. CAI curated a list of commercially viable inventions through their existing relationships with 80+ federal agencies and research organizations for the European market. OGV is using their training program to match entrepreneurs with the IP and leverage their entrepreneurship and innovation ecosystems to commercialize the intellectual property. Oxford Global Ventures (OGV) was founded by experienced entrepreneurs and innovators with a track record of setting up, funding, and running new ventures, as well as providing mentorship and training in entrepreneurship and innovation. OGV has on its panel practitioner and academic leaders who can provide bespoke sector-specific mentorship for the six key enabling technologies according to the European Commission: Micro- and nano-electronics, nano-technology, industrial biotechnology, healthcare, photonics, advanced materials and advanced manufacturing technologies. We also target other broader areas, including digital services, Internet of Technology, and Artificial Intelligence. All OGV international programs are managed by professionals who understand the peculiar needs of the global cultures. For additional information about OGV, visit http://www.oxfordglobalventures.com. The Center for Advancing Innovation (CAI) is a global public-private partnership, non-profit focused on creating a virtuous circle of innovation and driving growth breakthroughs through novel, creative paradigms and models. CAI's mission is to accelerate and increase the volume of research commercialization in support of high growth business to ignite entrepreneurship, bolster the global economy, and maximize the commercial and knowledge-based potential of promising inventions. CAI's award-winning challenge-based accelerator, rigorous evidence-based due diligence, and capital-efficient lean management models serve to hyper-accelerate "gazelle" high-performing startups for outsized investor returns. Through its NIH-sponsored Breast Cancer Startup Challenge, Neuro Startup Challenge, and Nanotechnology Startup Challenge in Cancer competitions, as well as its NASA-supported SPACE RACE startup challenge, CAI has launched 80+ startups and trained more than 2000 entrepreneurs. For additional information about CAI, visit http://www.thecenterforadvancinginnovation.org. The Center for Advancing Innovation Inc.